The life cycle of a Monty Python sketch is to start off funny and be quoted over and over and over by people who will never get girlfriends by doing so until it eventually has all the humour thrashed out of it and become public policy. Think, for example, of the classic Argument Clinic sketch, or The Black Knight scene Â and tell me these aren’t spookily prescient of modern political discourse. 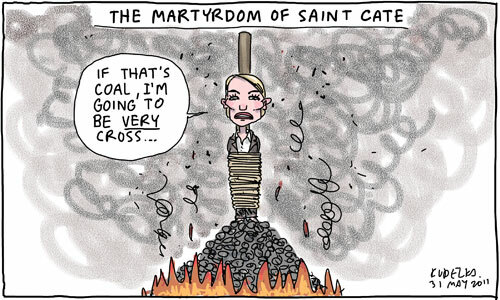 Now turn your thoughts to this week’s burning of Cate Blanchett at the stake, then take a look at the witch trial scene from The Holy Grail (if you have never seen this movie, you are dead to me). Try to imagine Barnaby Joyce shrieking “She turned me into a newt!” and it all falls into place. From what I gather, if Cate Blanchett weighs as much as a duck, then climate change isn’t real, and the science on Cate Blanchett/duck weight equivalence is totally utterly in, so take that andÂ pass the matches. If you want some extra humour from the original scene, watching Eric Idle’s desperate attempt to not corpse by putting the scythe in his mouth. Malcolm Turnbull anyone? Now I understand why I appreciate your work so much. The Monty Python sanity lens certainly brings absurdity into sharp focus.